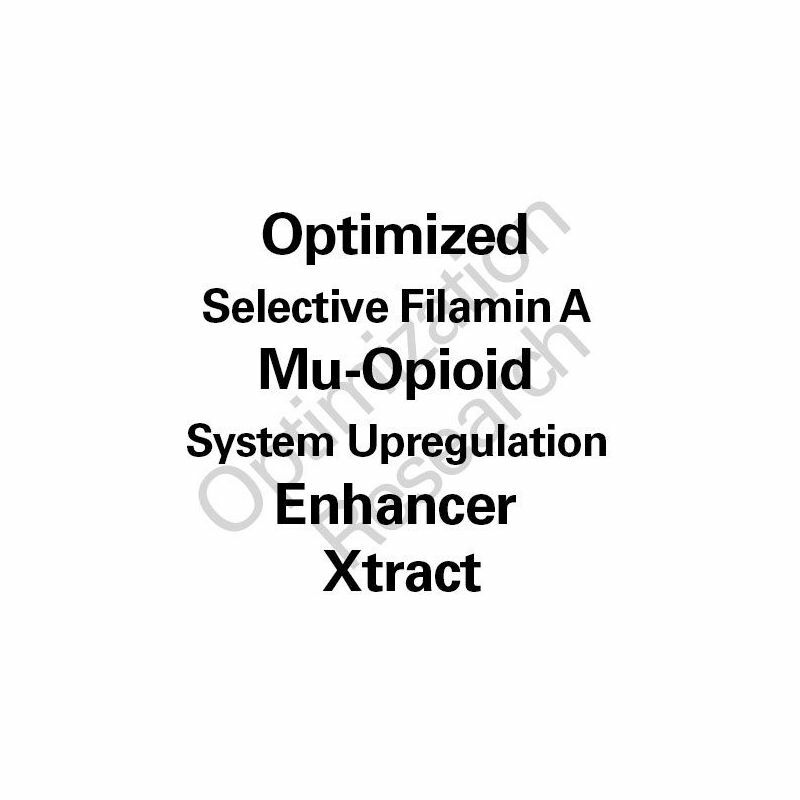 SFME-OX Selective Filamin A MOR-System Enhancer Optimized Xtract binds Filamin A in a highly selective manner that demonstrates the effect of markedly reversing and reducing Mu-Opioid Receptor System (MOR-S) tolerance. Research Indications: Analgesia Research, Addiction Research, Opioidergic Research, Anti-Inflammatory Research. 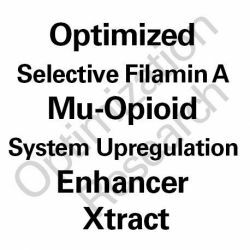 SFME-OX Selective Filamin A MOR-System Enhancer Optimized Xtract binds Filamin A in a highly selective manner that demonstrates the effect of markedly reducing Mu-Opioid Receptor System (MOR-S) tolerance. SFME-OX further demonstrates a marked reduction in inflammatory cytokine production. Source Plant: Proprietary Lobelia species. In vitro data shows selective pM affinity binding at the Filamin A protein pocket that produces an marked enhancement MOR tone within an upregulation of MOR expression. In vivo efficacy in murine models has been demonstrated eliciting a reversal of downregulation created via mu-opiate administration thus potently reducing tolerance to mu-opioid receptor agonist agents as demonstrated. Concurrent and weekly alternated administration with ADDX-OX and ADDX-BOOST both demonstrated a highest degree of efficacy and total reversal of tolerance. SFME-OX is anticipated to provide potent upregulation of the Mu-Opioid Receptor sensitivity/expression at dose arms of 10mg and 20mg via oral route to be administered once daily. Said administration is projected to provide a rapid restoration of sensitivity to opiate therapeutic agents and allowing a marked reduction in dosage to provide superior positive effects with reduced adverse effects. An optimum course is anticipated to be via a 1 week of usage followed by 1 week of discontinuance alternating schedule. Alternating weekly administration with ADDX-OX and/or ADDX-BOOST has demonstrated to enable the most superior and sustained sensitivity to MOR agonist agents. The further addition of KORX-OX as well can potentiate the greatest efficacy within this scope. Since the late 1990's to early 2000's a predictable problem in those needing strong pain medication has been the eventual tolerance(1)(2). The phenomenon has been revealed to in large part extend to the neural de-sensitization of the receptors was uncovered(3). This has provoked much research and has created a dilemma in the medical profession, forcing caregivers and doctors alike, to adjust or augment the dose of opioid-like painkillers, often unexpectedly(4)(5). In severe trauma and other debilitating conditions such as multiple sclerosis, cerebral palsy co-existing with injury, and in many other circumstances where severe, complex neurological and/or musculo-skeletal pain endures, there aren't many alternatives to opioid-narcotics (at least equivalently effective ones)(6)(7). In dentistry, after a surgery or operation the same is true regarding alternatives, limited indeed(8)(9). In all of this, the pain has to be taken care of in order for the patient to fully cooperate with his/her medical advisory - one isn't likely going to be very motivated to go anywhere if they are in so much pain irrespective of tried prescription remedies and such(10)(11). Now imagine a scenario in which a severe sports complication or an elderly individual falls or has some other traumatic event causing injury, or worse yet an individual with a complex, chronic severe pain condition, and their opioid pain medication which is supposed to do the trick, or in the very least make the pain manageable, starts whittling down in effect. Furthermore, to worsen the ordeal, higher and higher doses are creating increased side-effects! Maybe even as intolerable as the pain itself...amd potentially with more health related impingement. Or consisting of increased pain due to the med losing it's effectiveness!! Current opiate-related pain treatment protocols and methodologies have failed miserably to address pain, especially complex and challenging pain syndromes, within the strong predisposition of the medications being employed losing the effectiveness at any rational dose that can be within range to have low incidence for the induction of serious adverse effects; these include but are not limited to induction of hyperanalgesic tone, gastro-intestinal shutdown, respiratory compromise, and psycho-emotional dysregulation. What's the solution? Because the bridge certainly doesn't look too sturdy from here. We need something that will allow victims of debilitating illness or severe injuries to utilize at maximum(optimal) efficiency the lowest possible therapeutic dose of their prescribed opioid pain medication. Failing that, those who suffer are just lost and burdened with heavily restricted with worry, fear, and limited options. We need something that can act as a regulator of the entire system it works on, or at least the part that contracts to the alleviation of pain. Now while some preliminary research was done a few years ago regarding re-sensitizing the responses to opioid pain medications, it was just that, very VERY preliminary..(12)(13).and probably not the best case made in favor of overall efficacy. However, new research is being presented by TeamTLR which aims toelucidate the root problem, and provide a potential solution that will provoke a new awakening in the pinnacle of medical research with regard to these issues. The research compound is valuable and a huge step forward and goes by the name SFME-OX. 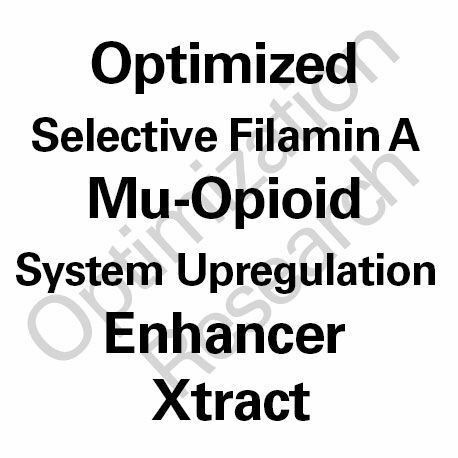 SFME-OX:Selective Filamin A MOR-System Enhancer Optimized Xtract binds Filamin A in a highly selective manner that demonstrates the effect of markedly reducing Mu-Opioid Receptor System (MOR-S) tolerance. Note: Cytokine's are small proteins involved in cell-signaling and a collection of them are involved in specific growth related processes as well as with inflammatory modulation. However, abundance of them relates to their significance and too many or too much production of them often leads to inflammatory responses which can lead to brain and joint inflammation. Most NSAID medications don't directly antagonize, but indirectly reduce cytokine mediated responses and other pain relievers may offer some relative protection. However, these agents generally do not go against the 'grain' in a fashion to reduce the source of the issue(!). SFME-OX is anticipated to provide potent upregulation of the Mu-Opioid Receptor sensitivity/expression at dose arms of 10mg and 20mg to be administered once daily. Said administration is projected to provide a rapid restoration of sensitivity to opiate therapeutic agents and allowing a marked reduction in dosage to provide superior positive effects with reduced adverse effects. An optimum course is anticipated to be via a 1 week of usage followed by 1 week of discontinuance alternating schedule. As you can see with the overview above, this is more than just evidence, but rather;an active trial that is long over-due - and the human trials will become the brew for the future insights and management of chronic pain and other disorders where opioid-systems or their malfunction plays a critical role. This may expand to even mental disorders such as depression and anxiety, to which mu-opioid receptors also play a huge role(14)(15)(16)(17). Which brings me to my last point, because we have already seen the devil of de-sensitization with many anti-depressants (although in these cases, de-sensitization is often postulated to be beneficial) - the worry that would come with developing mu-agonists for depression or anxiety would stem from the possibility (or even probability) of fairly quick tolerance(18), as well as potentials for abuse, especially within the habituation and tolerance. Where most anti-depressants on the market now increase in effect the longer you take them (19) - an agonist at the mu-receptor would most likely be the opposite(20), given they are within the GPCR (G-Protein-Coupled-Receptor) family and have marked potentials for tolerance. So SFME-OX represents a future and present research tool for these dilemmas. The progress we make now will be as vast considerations for the future developments and even as a course of augmentation not prior seen and long overdue. The unprecedented value in clean and significant MU-OPIOID SYSTEM SPECIFIC re-sensitization has potentia to revolution the use of opiates for pain management therapies. Therein,both on a Central Nervous System and on a peripheral level, this critical method of re-sensitizing and enhancing the mu-opioid-complex function will prove to be a novel, long over due approach to the current treatment regimens or augmentation of current treatments providing a better outcome for patients with a multitude of health complications sensitive to Mu-opioid-receptor function.